Luxurious wood wine rack bin counter with archway has a handcrafted look that completes fine custom racking, at a price that only a modular kit could offer. Holds 132 bottles of wine. Luxurious wood wine rack bin counter with archway has a handcrafted look that completes fine custom racking, at a price that only a modular kit could offer. Holds 132 bottles of wine. Every individual component of the designer system is available in classic stains that will complement any decor. Designed with the look and quality that will last a lifetime. Diamond Wine Bin Counter w/Archway - Size: 72"H x 45-11/16"W x 12-11/16"D - Made in the U.S.A.
Is the shelf finished? Does the kit come with molding? BEST ANSWER: If by "finished" you are asking if it is stained, yes I bought mine in the redwood stain which was extra. The tabletop has a molding strip that overlaps the diamond box, but if you need a crown mold for the top, I believe you would have to purchase that finished piece of wood. The top wood above the arch is a flat board flush with the ceiling. The wood has a mat finish and is available in different stains . Yes you can buy moldings to finish. I would suggest calling a storage consultant at 800-377-3330 to discuss the stain options in detail. 1. What are the dimensions of the rectangular part of the opening excluding the arched part? 2. What is the height from the bottom of the structure to the counter? 3. There is a table in a picture on pintrest in front of this Wine rack. Do you carry that product? 4. Does Designer make a 2 column rack kit? BEST ANSWER: Dimensions of the openings are 11 15/16" The height to the counter is 34 7/16" Yes, there is a 2 column rack available in the Designer Series. Can this come with a base for wooden case storage rather than the diamond design? Tired of the usual wine racks to house your growing collection? Try this on for size! 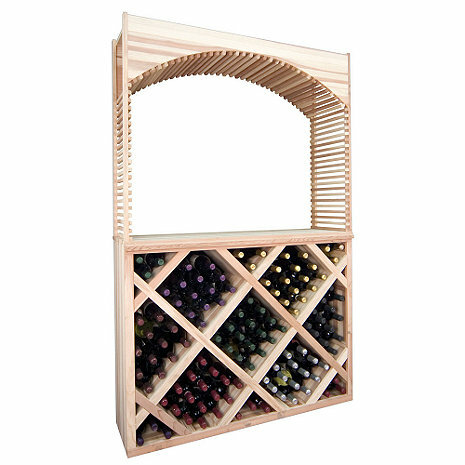 The Designer Wine Rack Kit – Diamond Wine Bin Counter with Archway brings you bulk storage options with a twist. This 72"H x 45-11/16"W x 12-11/16"D wine bin counter can house approximately 132 bottles of wine in a very organized fashion, Moreover, the archway design makes for a stylish and contemporary chic look that can surely turn heads in your wine cellar. At under $150, it's an absolute steal! Also, chalk up additional points for easy-peasy customization features by choosing from a variety of stain options and finishes for this wine rack. Buying for your wine cellar has never been this satisfying, we tell you!